Woods was established in 2002 following the acquisition of the operations of former Woodward Governor (Japan) Kansai plant. As the only Woodward-certified Channel Partner in Japan, our primary business is to provide after-market support on Woodward products in various applications for users in Japan. We are focused in keeping our customers’Woodward governor products and systems under the best conditions with full support from Woodward. Factory repair/overhaul, and on-site field service are available around the clock to attend to customer needs and emergencies. Woods was established in 2002 after the MBO of the former Woodward Governor （Japan）Kansai plant and operations. Woods is responsible for the after-market servicing of effectively all Woodward products for Japan. We are focused in keeping our customers’Woodward governor products and systems under the best conditions with full coordination with Woodward. 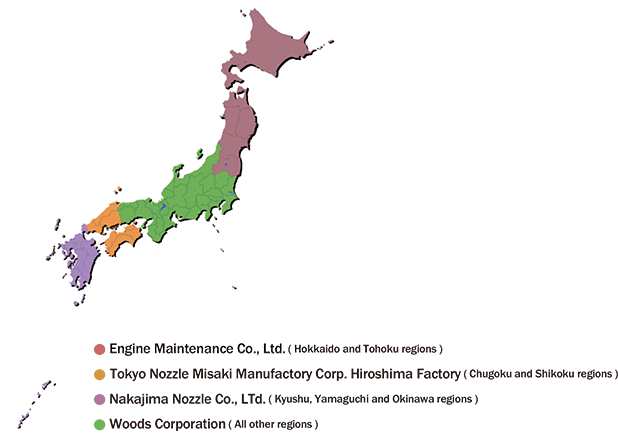 We currently have 3 authorized independent service facilities (“AISF”) in Japan. Each is set to provide the best service to customers in their respective regions, as shown below. In addition to the Japan domestic market, we have authorized Roswood Co., Ltd. to cover customers in far-east Russia.